'John Abraham has Popeye's muscles and Bluto's scowl, but how many times can you watch a deadpan Hulk pull out a van door or burst forth from a truck tyre?' asks Sukanya Verma. A mysterious man in a hoodie drags an unconscious fella towards a wooden pyre. As soon as the latter regains senses, he discovers he is tied to the logs, loud sounds of Sanskrit shlokas are booming all around and the tall hunk is going on and on about some matchstick analogy. 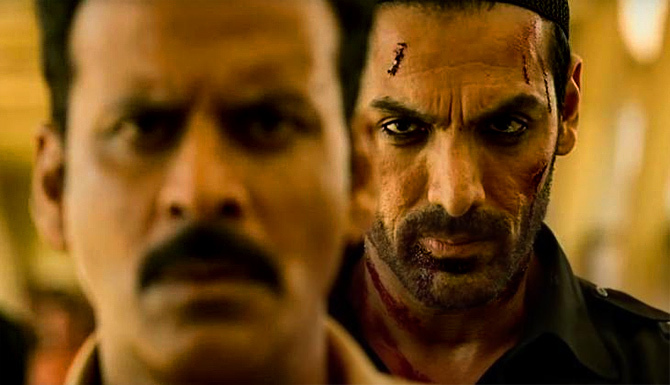 Meet serial corrupt cop killer John Abraham, a character born out of Aakhri Raasta and Shahenshah's leftovers that strains to evoke Deewar and Shakti-reminiscent sentiments out of Manoj Bajpayee, the only decent policeman in all of Satyamev Jayate. While Abraham's fire-breathing dragon sends off few more bribe-taking officers to direct hell, Bajpayee gets cracking down on his case and reveal the initial reason the film is called Satyamev Jayate. The individual letters of the title signify the location of the incinerated cops -- something Bajpayee miraculously deduces on the basis of a homophone. Of course there are just too many letters to prolong the ploy in a script that cannot even pretend to be clever. Director Milan Milap Zaveri's dreadful lack of originality would be a little more bearable if it wasn't so tedious about its nostalgia. Every single phone call between a duty-bound cop and self-appointed vigilante is a gabby round of steal a march versus rain on your parade. It's only marginally less laughable than John Abraham attempts to look sly. The film labours to paint him as this model citizen volunteering at cleanliness drives and rescuing stray puppies yet his mineral water-glugging, needless plastic amassing and flirting with the vet (Aisha Sharma who sounds like Suniel Shetty every time she opens her mouth) has a different story to tell. Satyamev Jayate is so committed to Abraham's pyromania it happily overlooks all the damage his irresponsible justice seeking leads to. From blowing off petrol pumps to causing stampedes in public places, his so-called valour reeks of hypocrisy. It's foolhardy to expect nuance from a jaded action drama that not only recycles 80s clichés, but also expects to pull off a reckless revenge in the absence of Amitabh Bachchan's charisma and Sunny Deol's fury. Only Satyamev Jayate's predictable twists and superficial emotions have absolutely nothing new to offer. What it does is test your threshold of pain. Zaveri's energy-sapping hysterics pitting Islamophobic cops and Abraham's saviour act ('Patil ho ya Qadri, sabki ek biradri') during a bombastic, blood-soaked Muharram ritual is where I threw in the towel. John Abraham has Popeye's muscles and Bluto's scowl, but how many times can you watch a deadpan Hulk pull out a van door or burst forth from a truck tyre? And if Manoj Bajpayee chitchats on one more phone call as the gyaan spewing, exasperated, righteous law enforcer with a soft spot for his outwitting adversary, it qualifies as stock character. If the anti-corruption baloney isn't agonising enough, the writer in Zaveri over-rides the film-maker and stuffs the scenes with excessive verbosity. After 141 exhausting minutes of unending appeals, phony revelations and long-winded dying words, the only satya I cared about is there is a cab outside the theatre waiting to take me home.